The Adam Equipment AQ mechanical steelyard platforms scales are made from durable, high-grade steel with a rustproof coating and are designed and built to last. AQ platforms are easily accessible and come complete with 4 wheels for easy mobility and quick easy weighing using the graduated beams. 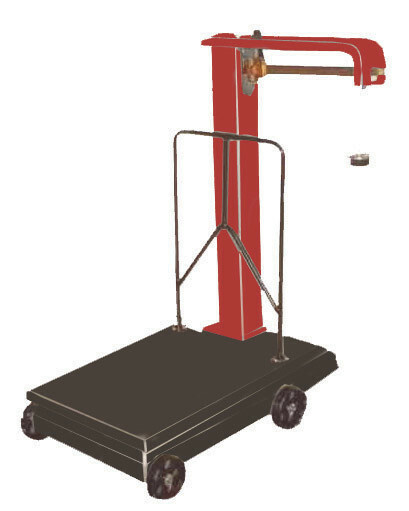 A large platform weighing area completes this robust mechanical scale with weight capacities up to 500kg. The AQ platform scale is purpose built for use in steel and scrapyards and is frequently used in industrial warehouses, factories, packing and shipping environments. Note: AQ 100K models are static, bench-operated units with no wheels or backrail like that shown in the product image. Breweries: Includes a rustproof surface ideal for weighing and transporting beer kegs and barrels of wine before distribution. Winemakers: Includes a large, mobile platform weighing surface ideal for weighing crates of grapes before fermenting, or barrels of wine. Automotive Perfect for transporting and weighing engine parts and tools in vehicle manufacturing facilities. Industrial warehouses/ factories: Provides a flat surface for weighing and moving several pallets, boxes or crates simultaneously. Scrap metal: Whilst not trade approved. These steelyard scales are purpose built as a guide for weighing scrap metal.